Salespeople working on commission are covered by a number of federal, New York state, and New York City laws. 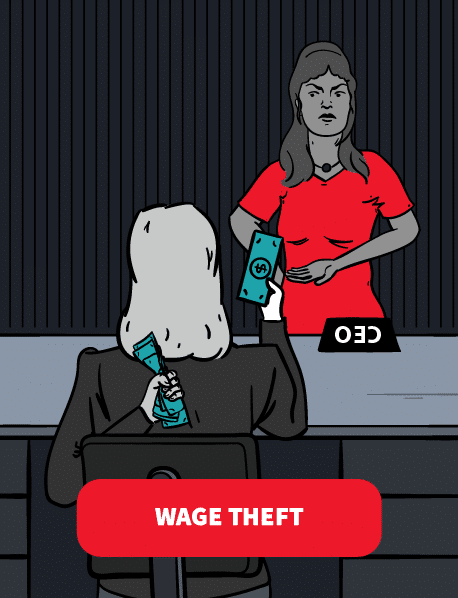 These laws protect salespeople from wage theft by their employers, which can be a major problem for workers who receive commissions. If you have been the victim of wage theft, including denied overtime pay or other illegal conduct by your employer, you have legal rights. A New York employment lawyer can help. Commissioned salespeople must have a valid employment contract that includes certain information. Employers are required to provide these contracts to salespeople paid on commission. The contract must include a description of how wages, salary, drawing accounts, commissions, and all other monies earned and payable will be calculated. They must also state how often the employee will be paid. If the agreement provides for a revocable draw, the contract must state the frequency of reconciliation. Finally, the employment contract should state any other details pertinent to the payment of all monies earned, either through wages, salary, commission, or any other means, when the employment relationship ends. Salespeople are not required to reimburse a draw against their commissions UNLESS the employment agreement explicitly states otherwise. Salespeople are entitled to all “earned” commissions, even after they quit or are terminated from their position. Regardless of which party ends the contract, salespeople must receive earned commissions, which are legally considered wages under labor law. If there is no employment agreement explaining when commissions are deemed “earned,” courts will look at the past dealings between the employer and salesperson. If there are no past dealings, a commission is considered earned when the salesperson produces a client ready, willing, and able to enter into a contract with the employer. Under New York Labor Law, independent contractors must receive their commissions within five days of the end of their contract, regardless of whether the salesperson quit or was terminated. Salespeople who earn a commission may be entitled to overtime. Outside salespeople are not entitled to overtime pay. However, some employers may misclassify salespeople as outside salespeople in order to avoid overtime and other benefits. Your primary duty is the sale of goods or services, or the rental of facilities. You “customarily and regularly are engaged outside the employer’s place of business,” meaning you make your sales at the customer’s home or place of business. However, if you perform other duties apart from outside sales, you may still be eligible for overtime. Outside sales do not include sales made by mail, telephone, or the internet. In particular, telemarketers are not considered outside salespeople. It is the employer’s responsibility to keep accurate records that establish these three conditions. If your employer has not kept adequate records, it cannot use the overtime exemption to avoid paying you overtime. Further, if these conditions are not met, you are not considered exempt and you are entitled to overtime. Some inside salespeople are not entitled to overtime because they are exempt under the federal Fair Labor Standards Act (FLSA) and New York Labor Law. The FLSA exempts particular types of employees, including those employed by a retail or service establishment, provided that more than half of the employee’s total earnings consist of commissions. If you are not an outside salesperson and you do not fall into one of the exemption categories, you are entitled to overtime. Commissioned salespeople who spend most of their time at the physical location of their employer, including home offices for remote workers, and who make less than half of their pay from commissions, are entitled to overtime. This means time-and-one-half at your regular hourly rate for every hour over forty in the workweek. Your employer must calculate your hourly rate from your earnings even if you are not paid by the hour. Commissioned salespeople have several options if they have been the victims of wage theft or other illegal conduct by their employers. If your employer has violated the federal Fair Labor Standards Act, you can file a claim with the Wage and Hour Division (WHD) of the U.S. Department of Labor. The WHD can oversee the payment of back wages by your employer. In addition, the Secretary of Labor can file a lawsuit on your behalf seeking back pay and liquidated damages. For violations of New York law, you can file a claim with the Division of Labor Standards at the New York Department of Labor. Similar to the WHD, the Division of Labor Standards can approach your employer and demand back pay or file a lawsuit on your behalf. Both agencies provide the claim forms online. You can also file your own lawsuit in court. Under federal and state law, if you win your case your employer must pay your attorney fees. You do not have to file with an agency before you can take your claim to court. It is possible to file a claim without an attorney. However, the ways in which these laws apply to your particular situation can be complicated. You may want to speak to a New York employment lawyer before taking action.